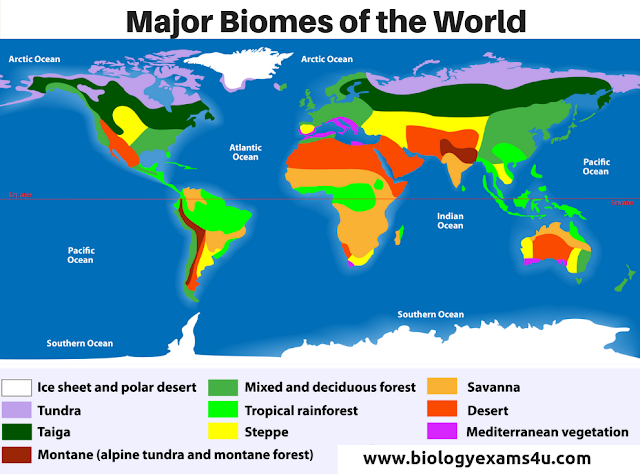 Biomes are major ecosystems delimited by particular geographical area or climate. Large ecosystems or communities which are characterized by different kind of plants and animals are termed as biomes. Biome includes actual climax community and several intermediate communities occurring within the same climatic condition. There is no sharp line of demarcation between adjacent biomes but the margins of each biome mix with the adjacent through a broad transitional area called ecotone. For example, an extensive region in Northern Canada where the tundra and coniferous forests blend in the tundra-coniferous ecotone. Biomes are often classified in seven categories:Tropical rain forests, savannahs, deserts, temperate grassland, temperate deciduous forests, taiga and tundra. Important features: Multi storied vegetation. Shows maximum biodiversity-lianas, epiphytes, tree show root buttress. Hopea and Dipterocarpus are the commonly available tree species.Tree include ebony, mahagony, cinnamon, fig, rubber etc. Plams, plantains, bamboo occur here and there. Fauna(Animals) include deer, goat, antelope, elephant, snakes, lizards, parakeet etc. Important features:Tropical open grass land with shrubs and trees. This biome supports buffalo, tiger, zebra, mites, grass hopper, beetles and ants. Desert is the most driest ecosystem in the environment. About one fifth of the earth surface is occupied by deserts. There are two types of deserts depending upon the nature of temperature. Those with high temperature are known as hot deserts (Thar, Sahara) and very cold type deserts are known as cold deserts (Gobi). Important features: Most of them are succulents(cacti) and thorny bushes types. Ephemerals, annuals, shrubs etc are also seen in deserts. Animals like reptiles, insects and burrowing rodent types. The camel,ostrich etc have an ability to store water in their body and they drink water occasionally. Important features: Mostly leguminous herbs, scattered bushes, occasional tress, extensive root system. Fauna-Deer, elk, bison, wolf,rabbit,sheep,mice, burrowing owl etc. Examples- Prairies of USA, Pampas of South America, Steppes of Eurasia, Tussocks of New Zealand, Veldts of South Africa, Downs of Australia. Important features: Shrubs, herbs, ferns, mosses, lichens, grasses, vines are seen.Dominant trees are oak, birch, maple, beech,magnolia,poplar,chestnut etc. Fauna consists of of deer, fox, rabbit, hare, snakes, lizards, salamanders, owls, sparrows etc. Important features: Gymnosperm with cone shaped canopy, have needle shaped leaves. Pine , Deodar, cypress, Spruce etc.Lichens, mosses, ferns,herbs are abundant. Fauna includes wolf, deer, rabbit, hare, elk, squirrels, porcupine etc. The soil of coniferous forests has thick layers of litter and humus and is typically known as podzol. The rate of decomposition is very low due to low temperature. It is a type of biome seen in the cold Arctic regions beyond 600N in between needle leaved forests and Arctic ocean. Tundra means marshy plain.The soil is almost permanent frozen and this frozen soli is called permafrost. Important features: Encircles the top of the world. Scattered patches of grasses, sledges,lichen. Amphibian and reptiles are absent, common animals are lemming, snow grouse, snow owl, arctic fox, polar bear, reindeer,arctic hare. Low diversity and low productivity.